A run of recent setbacks in the unions has taken a bit of the gloss off the preceding sequence of election victories for members of the 'awkward squad'. Following the defeat of the firefighters and then the ousting of Mick Rix from the leadership of Aslef, the shock vote against national strike action by postal workers has taken a bit of wind out of the unions' sails and put some unaccustomed backbone into New Labour. It has left many fellow workers wondering when and if the much-heralded revival of union militancy is ever going to materialise. Among other things, what this little war cry tells us is that, for the rich and powerful, strikes matter a great deal, even when they don't happen. This is an interesting finding, especially when most of the rest of the time media pundits and industrial relations academics are telling us either that strikes are irrelevant or that working class militancy is a relic of a bygone era. Since the clearout of old guard union 'moderates' extended to the likes of Ken Jackson and Barry Reamsbottom last year, the amount of media focus on the awkward squad and what they might get up to has indeed been quite obsessive. There is a very simple explanation for this, which is that during virtually the entire decade of the 1990s official policy at the TUC and in most of the major unions was to avoid strike action wherever possible and to try to rebuild union membership and influence through partnership deals with employers. But this did not mean that conflicts of interest between employers and workers could be avoided entirely. What happened in practice was that union officials learned to use ballots for industrial action as a very effective weapon for twisting the arm of management. A thumping majority for strike action would help concentrate the minds of most employers wonderfully well and usually worked a treat. However, there is a big difference between threatening strike action but never carrying out that threat and actually going on strike. When the strike weapon is used essentially as a bargaining tool, concessions can be made but neither side loses face. The minute it goes to a walkout, the stakes on both sides are raised enormously and neither can afford to lose face. This is especially the case with disputes in the public sector, where the government is the ultimate employer and can risk humiliation if it is seen to back down. Over the last couple of years the main thrust of this TUC strategy has started to break down--mainly due to pressure from the government for never-ending PFI initiatives and 'modernisation' throughout the public sector and also in areas like the railways, where most of the workforce and a good 80 percent of the population are completely racked off with the impact of privatisation. Resistance to these policies is what has fuelled the rise of the awkward squad, alongside the wider currents of the anti-globalisation and anti-war movements. When Mick Rix of Aslef and Bob Crow of the RMT first came on the scene, they were able to make a big impression because they capitalised on hostility to Blair and to privatisation and were able to win massive majorities for industrial action despite media hysteria. Until about the beginning of last year, the usual upshot was that the rail companies caved in--most of them had enough problems to deal with without having to explain a total shutdown of the network to commuters. Had this situation been allowed to carry on, it would have signalled real problems for the government's determination to keep the industry in private hands, if not for its whole privatisation strategy. The government has thus taken a much harder line on threats of strike action on the railways--as we saw during the Arriva Northern dispute--at the same time as actually taking steps towards partial renationalisation (by, for example, bringing some of the larger engineering contracts back in-house and under much more stringent government control) in the hope of appeasing the rail unions. This change of approach in the rail industry is now coordinated by a civil service bureaucracy who not only monitor negotiations between individual train-operating companies and the unions but also tell the bosses exactly where to draw the line in talks. The same policy was in action during the firefighters' dispute, when the government effectively steamrollered any glimmer of weakness on the employers' side of the negotiations. By the time we came to the threat of a national postal strike, then, things had actually moved on again. Leaders of the CWU might well have assumed that a big vote for strike action would be forthcoming and that this would be enough to force the hands of Adam Crozier and Allan Leighton. But enough of the members were clearly a bit wary that things might escalate and, not unreasonably, did not relish a drubbing like the firefighters. 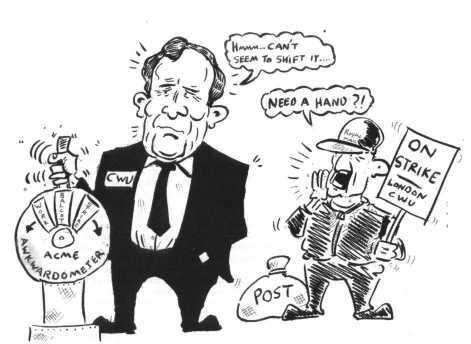 Also, the experience of recent talks in the industry was still fresh in the memory when CWU members had voted in favour of strike action, only to see the leadership settle for a slightly improved offer and then ram home acceptance. The rank and file does not appreciate being treated as a stage army and this could well be one of the reasons that the CWU vote backfired so spectacularly. There was more than a hint of this in the FBU dispute as well and, if Andy Gilchrist seriously believes that the leadership didn't do too badly he really must be living in a dream world. None of this is particularly inspiring for those of us who would much prefer to see Blair get his comeuppance. But it does emphasise the extent to which the hammerings taken by the unions, mainly during the 1980s, can still weigh heavily on current struggles. Even though there are less than six months to go before the 20th anniversary of the start of the miners' strike, the effects of that defeat continue to reverberate. Apart from the psychological scars on just about anybody now in their forties or fifties (including most of the awkward squad) this also means working out how to deal with the legal straitjacket imposed on the unions by Thatcher and continued by Blair. If the experience this year in the FBU and, to a lesser extent, in the CWU, is anything to go by, a very steep learning curve is going to be required if further knockbacks are to be avoided and morale restored. What has been most disappointing, if not infuriating, about these examples is that there was absolutely no need for them to go the way they did. In the case of the firefighters, opposition to the government was absolutely overwhelming inside the industry and among the general public. And there is absolutely no question that, in the country as a whole, the general climate is one of total hostility to the government plans for student fees, foundation hospitals, pensions and ID cards. These comments are very revealing because they show that, despite the press caricatures, even the most radical members of the awkward squad are hesitant when it comes to strikes. This is where we get to the crux of the issue, because surely no one in their right mind wants strikes for the sake of it? The trouble is that, like it or not, effective strike action is actually the only way to win. Otherwise, why did Baroness Thatcher go to all the trouble of introducing an entire encyclopaedia of new laws--all designed to stop strikes happening or make them as ineffective as possible? The reason is that Thatcher drew her own lessons from the period of working class history which is the least mentioned by mainstream pundits but which is the most inspiring for any trade union activist and socialist. This is the four-year period of the great upturn, between 1970 and 1974, when one group of workers after another not only went on strike but won fantastic victories. Strikes and flying pickets, mostly entirely unofficial, led to general strikes, defied the law, got dockers out of jail, put out the lights and brought down governments. During this period, no one ever worried that younger workers would need more time to be apprenticed to the struggle or that strike action would act as an impediment to unity. Every one of the major strikes which took place during this period--from the occupation at the Upper Clyde shipbuilders, through to the Pentonville Docks strikes and the two national miners' strikes--electrified and inspired an entire generation of new militants. The strike wave of the early 1970s not only restored morale in separate industries, in the case of the miners it drew a line under a 50-year period since the end of the 1926 General Strike during which the NUM had suffered nothing but defeats. These strikes also generalised the fightback between sections such as docks, mines, railways and engineering. And, contrary to some accounts, this generalisation was not solely limited to white male manual workers in heavy industry. It drew part of its inspiration from the events in France in 1968 and from the civil rights movements in the US and Northern Ireland. And the tide of militancy provided a platform for a huge upsurge of unionisation of workers in an expanding public sector, many of them women teachers and health workers. This is the tradition we need to look to if we are to move forward in the coming period and shake off the legacy of defeat.